Come aboard the only floating happy hour in San Diego. The Sights & Sips Sunset Cruise on San Diego Bay includes complimentary appetizers, no host bar- featuring refreshing drink specials and a perfectly timed sunset every Friday and Saturday during the summer. 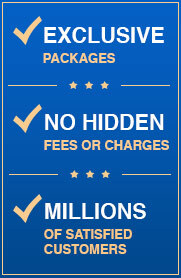 Hornblower Cruises & Events has provided stunning nautical venues for unique events, weddings, birthdays and anniversaries along with spectacular celebrations of all kinds for over 28 years. Come see what they have to offer! Consistently providing excellent guest experiences has always been the Hornblower style. From its beginnings in 1980 as a two-ship operation in, Hornblower Cruises & Events has focused on exceeding the expectations of its guests, and on maintaining the highest standards of safety and comfort for its vessels and facilities. Today, by satisfying its guests over the past quarter-century, Hornblower has grown to a $30 million business with 29 yachts, and is the market leader in each of the six California ports it serves. 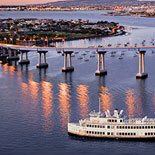 Get ready to enjoy the sights and sounds of the magnificent San Diego Bay. The Big Bay, as locals call it, boasts some of America's most historic warships such as the USS Ronald Reagan and the USS Midway as well as playing host to the scenic sights of the Coronado Bay Bridge and Seaport Village to name just a few. Take part in the Hornblower experience where the celebration begins the moment you come on board! 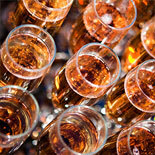 Start with cocktails on deck, then relax as our gracious crew transports you to a world of ease and luxury! You, that special someone and all your guests will feel pampered, privileged, relaxed and refreshed. It takes the art of entertaining to a whole new level. 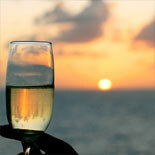 Make your reservations and buy your eTicket today for the Sights & Sips Sunset Cruise. You will have the time of your life and remember it for years to come! 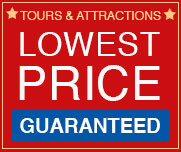 Cruise operates Fri and Sat from April 6 through October 27. Boarding: 5:30pm Cruising time: 6:00pm - 8:00pm. 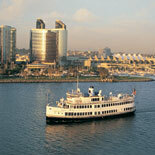 Hornblower Cruises ticket booth is located at 970 N Harbor Drive, San Diego, CA 92101. Limited Metered Parking - $1.25/hour, meters are free after 6:00pm, Sundays and on Holidays. Age the same regardless of age. Reservations are required. Dress in layers for comfort. Bring a Camera. Hornblower does have handicap accessibility on some, but not all, of the yachts and decks. Call customer service to ensure handicap accessibility. Boarding begins approximately 15 minutes before departure. Allow enough time for traffic and to find parking. Seating is on a first come, first served basis.